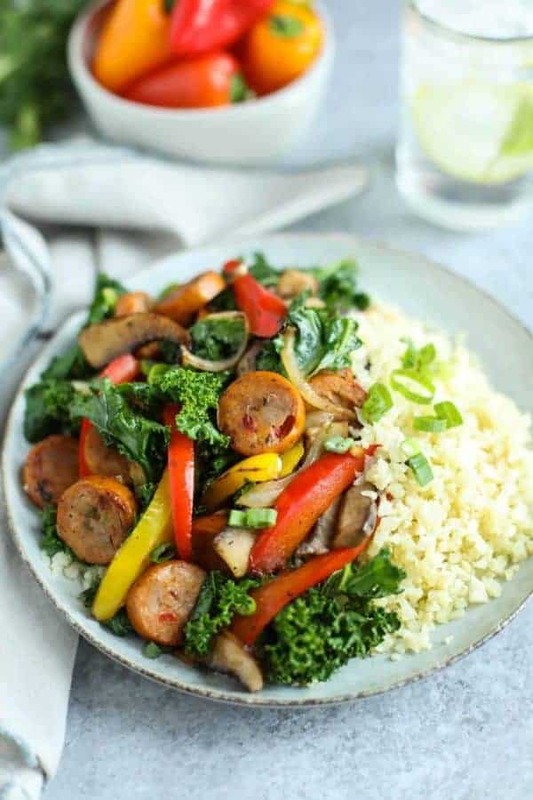 Whether it’s a meal prep recipe or a weeknight dinner winner that you’re looking for, this allergy-friendly Grilled Chicken Sausage and Veggies over Cauliflower Rice is just what you need! 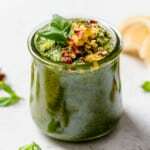 This post was created in partnership with our friends at Applegate. And you know what that means, don’t you? It means gatherings with friends and family, cookouts, and potlucks centered around plenty of good food. 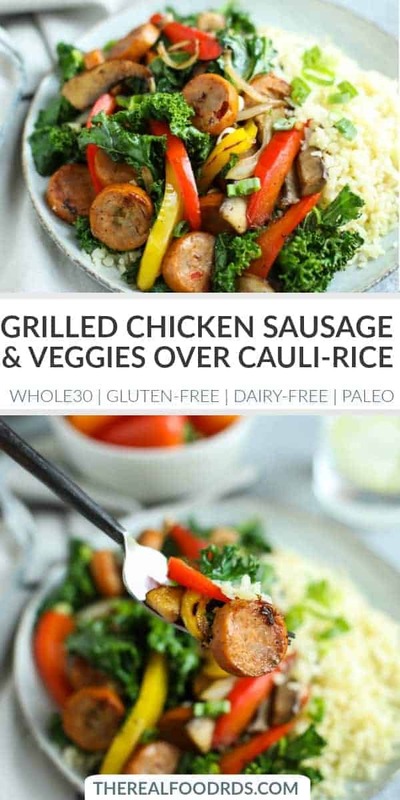 So to kick things off we’ve partnered with our friends at Applegate, makers of natural and organic meats to bring you this Grilled Chicken Sausage and Veggies over Cauliflower Rice recipe AND our newest recipe eBook, The 8 Best Whole30-friendly Summer Recipes. You can grab your copy of this FREE eBook by signing up for our weekly newsletters. If you’re already a subscriber, check your inbox because it’s there waiting for you. 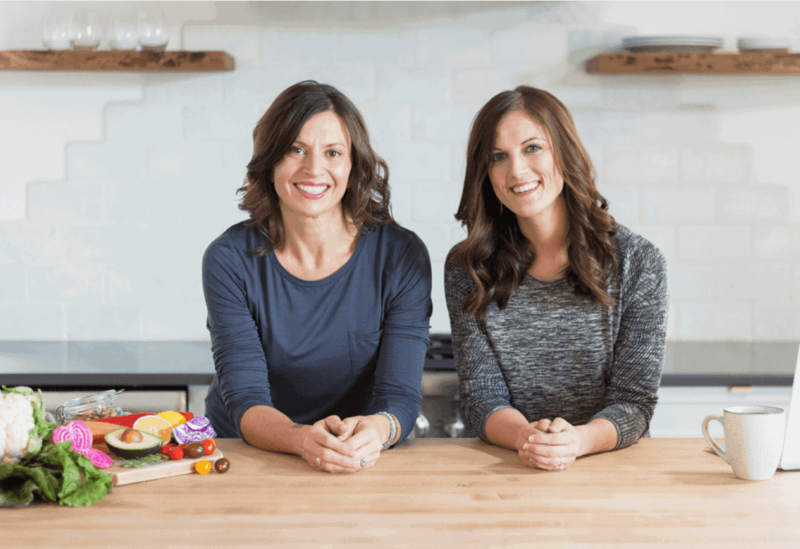 As you already know, it’s Whole30-friendly which in our book means plenty of veggies and healthy fat along with quality protein to keep you satisfied. 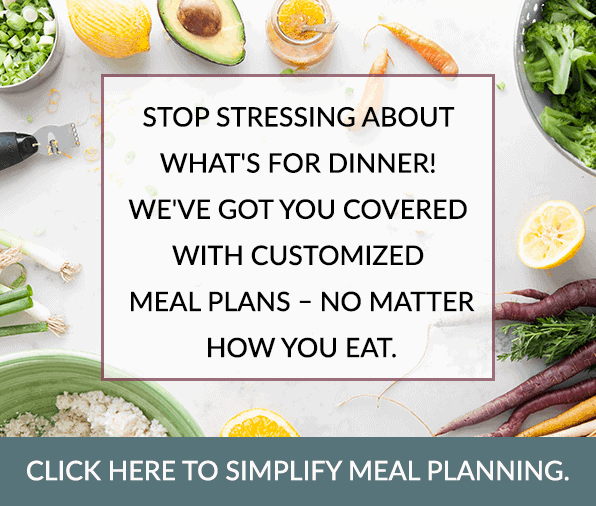 It’s easy to prep ahead making it perfect for weekend meal preps or an easy weeknight meal (more about that to come). It’s made on the grill so you can keep the kitchen cool while enjoying time outdoors. 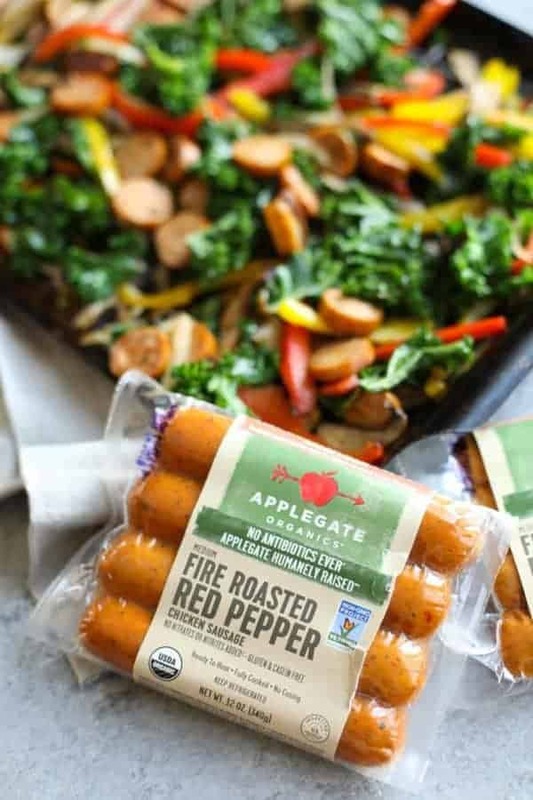 A high-quality, pre-cooked protein like Applegate Fire Roasted Red Pepper Chicken Sausage. 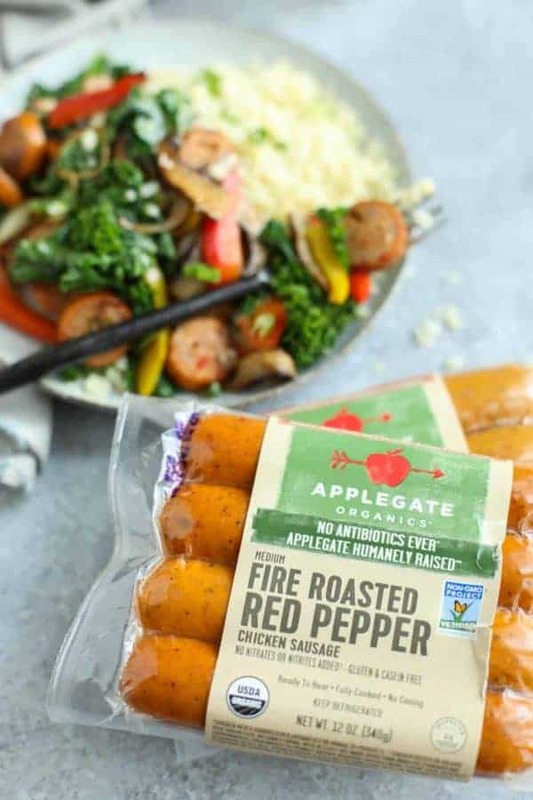 We love the taste and convenience of all the Applegate natural and organic products but this one recently stole our hearts with its blend of sweet roasted red and fiery jalapeno peppers (though don’t let the word ‘fiery’ deter you, these sausages are incredibly flavorful though rather mild). Veggies, veggies, and more veggies. If you haven’t noticed, we really like our veggies around here and know that you also appreciate a good veg-forward meal. 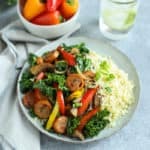 For this recipe, we’ve chosen sweet bell peppers, pungent onions, meaty mushrooms and nutrient-dense kale for a rainbow of color and nutrients. A perforated grill pan. Before you change your mind, hear me out. A perforated stainless steel grill pan will change your grilling life! You can use it for everything from grilled sheet pan dinners like this one or our One-Pan Chicken Fajitas to vegetables to fruit. Anything that can fall between the grates of the grill can be cooked on a perforated grill pan with ease. Trust me on this one, get a grill pan and you’ll instantly uplevel your grilling game. A skillet on the stove or the side burner of your grill. If you’ve got one of those side burners on your gas grill then you’re in luck, no need to go in the house. Instead, you can enjoy even more of the outdoors. But if not, don’t worry. Cauliflower rice takes just minutes to saute. 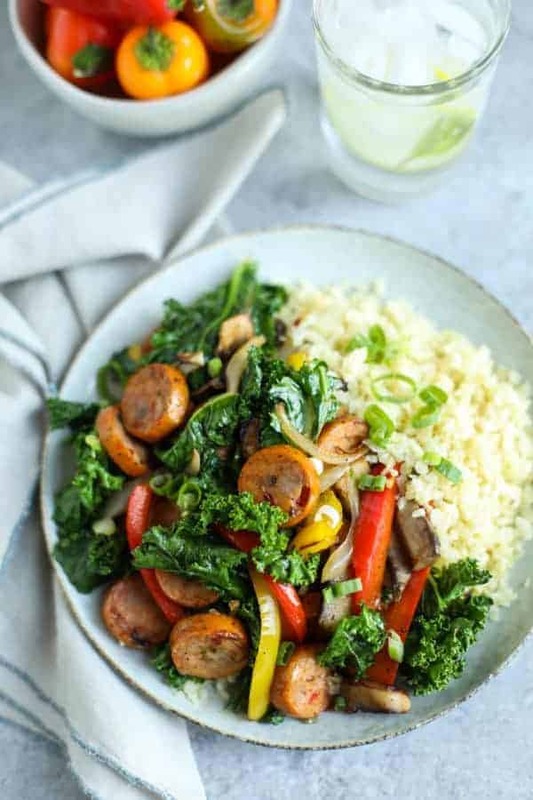 I already mentioned that one of the reasons we love (and you’re gonna love) this Grilled Chicken Sausage and Veggies over Cauliflower Rice is that it’s great for meal prep and busy weeknight meals. 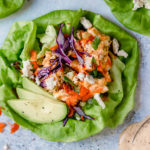 Basically, you have two ways to go about this: Cook the entire recipe start to finish for crazy easy reheat and eat meal or prep all of the ingredients ahead time so that it’s just grab and go from the fridge when it’s time to actually cook. 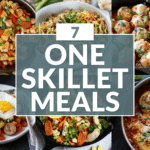 The latter of the two is usually how I roll with this recipe because I actually prefer a freshly cooked meal over a reheated one AND I love grilling and spending time outside with my family while I cook. Wash, dry and slice bell pepper and onions. 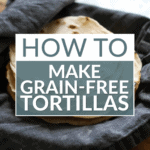 Place in large zip-top bag or container with a lid. Wipe mushrooms clean with a damp paper towel then use a spoon to gently scrape the black ‘gills’ from the underside. This isn’t absolutely necessary but will keep your dish from having that ‘muddy’ look when everything is covered with mushroom gills while cooking. Slice the mushrooms into ½-inch thick slices and add to bag with the peppers and onions. Peel and mince garlic. Add to pepper, onions, and mushrooms. Wash, pat dry and de-stem kale. 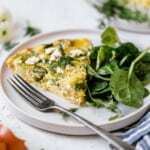 Tear kale into bite-size pieces and add to bag with other veggies. Slice the precooked Applegate Fire Roasted Red Pepper Chicken Sausage into ½-inch thick rounds. Add to bag with the veggies. Store the veggies and sausage in the fridge until ready to use. Prepare cauliflower rice up to the point of cooking it (but don’t cook it yet) if you’re not using pre-riced fresh or frozen cauliflower rice. 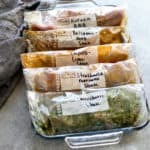 Store in a separate covered container or zip-top bag in the fridge until ready to use. When it’s time to cook, just preheat the grill and grab your grill pan. Add avocado oil to the bag or container and toss veggies and sausage to coat well before spreading it in an even layer on the pan. Now season with a little salt and pepper and get grilling! Fun fact: My husband bought me a fancy gas grill for Mother’s Day in 2008 (which I still have and use regularly) then he and my daughters bought me a smoker last year for Mother’s Day. I also do 100% of the grilling and smoking in our house and hubby is 110% cool with that. Bring on the summertime eats! I hope you enjoy this recipe as much as we do. 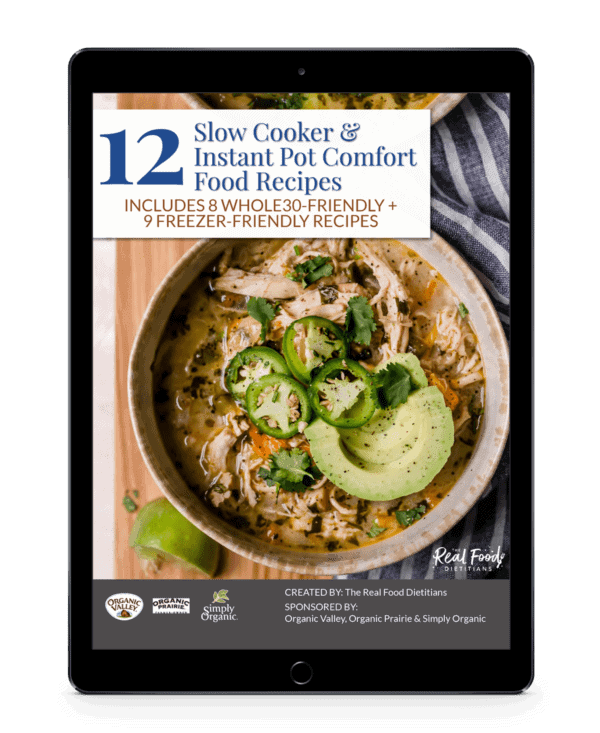 It’s equally at home on a busy weeknight or as a casual and healthy dinner served to friends or family. 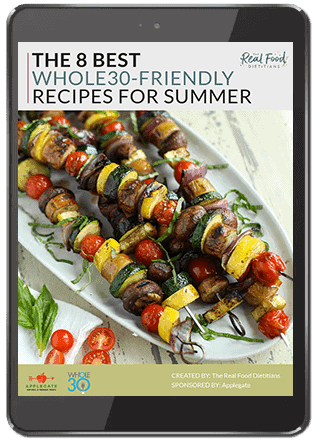 And don’t forget to grab your copy of our latest FREE recipe eBook which we created in partnership with our friends at Applegate to help you make healthy eating easier and more delicious this summer. Fire up the grill, grab your grill pan and give this recipe a try! This recipe is perfect for weeknight grill-outs because it’s quick to make and is incredibly tasty. We suggest serving it over cauliflower rice, a bed of greens or stuffed into a sweet potato. Prepare cauliflower rice according to package directions (or see our How to Make Cauliflower Rice recipe + tutorial here). Set aside. Preheat grill to medium-high heat (about 400℉; you should only be able to hold your hand over the heat for 1-2 seconds when held about 4 inches above the grill grates). 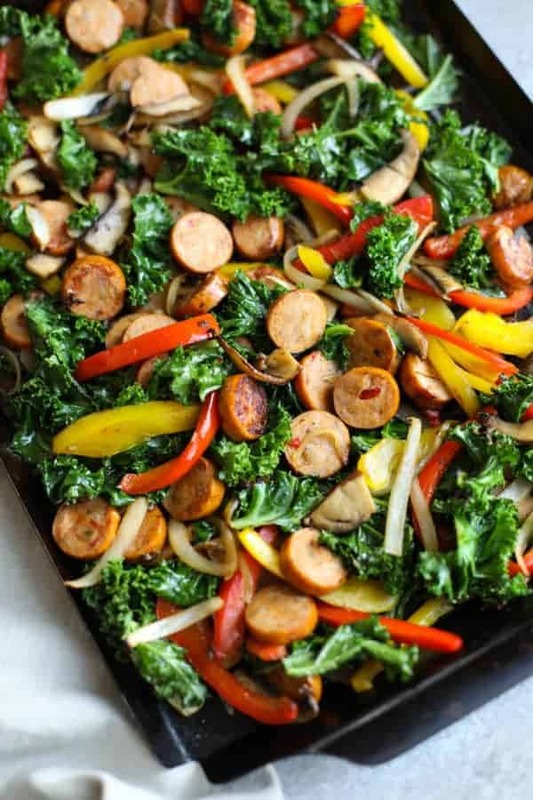 While grill preheats, toss peppers, onions, mushrooms, kale, and garlic with avocado oil. Season with salt and pepper. Slice sausages into ½-inch thick rounds. 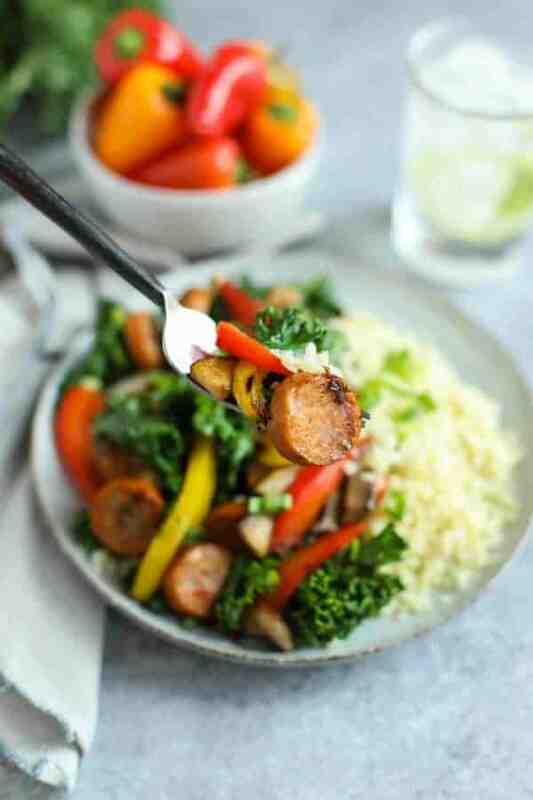 Arrange vegetables and sausages in an even layer on a large, perforated grill pan (like this one). Place pan over direct heat and cook for cook for 5-8 minutes. Open grill lid and stir sausage and vegetable mixture. Reduce heat to medium-high if veggies are starting to burn on the edges. Continue cooking for an additional 8-10 minutes, stirring occasionally, until veggies are tender and slightly caramelized. Remove from heat and serve over cauliflower rice. Garnish with sliced green onions, if desired. What types of recipes are your ‘go-to’ when it comes to busy weeks and lazy summer days? Share in the comments below! Do you think that I could do this in the oven? For the oven would you treat it as a sheet pan meal? How long would you cook for and at what temp? 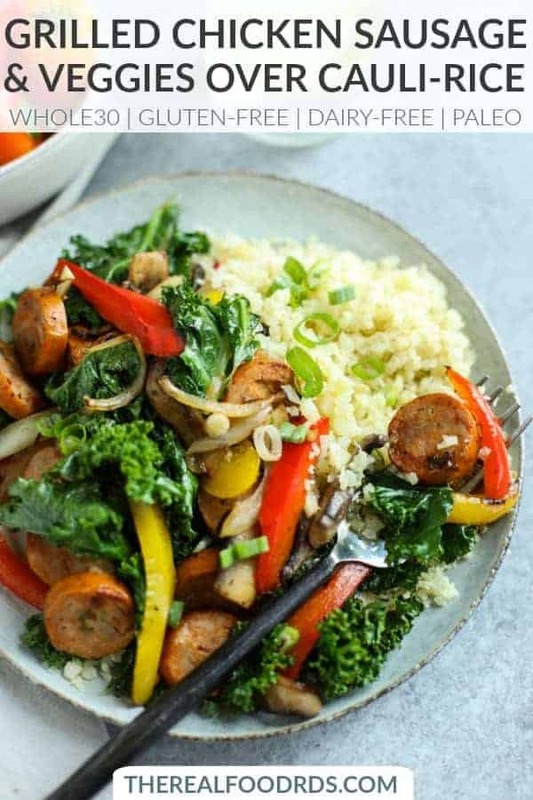 Yes, I would put the sausage and the veggies on a rimmed baking sheet and bake at 400F for 25-35 minutes (depending on how big your veggies are) or until the veggies are tender and to your liking.